Discussion in 'Football Forum' started by Utdfrom2002, Apr 8, 2019. Surprised no thread yet. Hoping to see some upsets this round too. 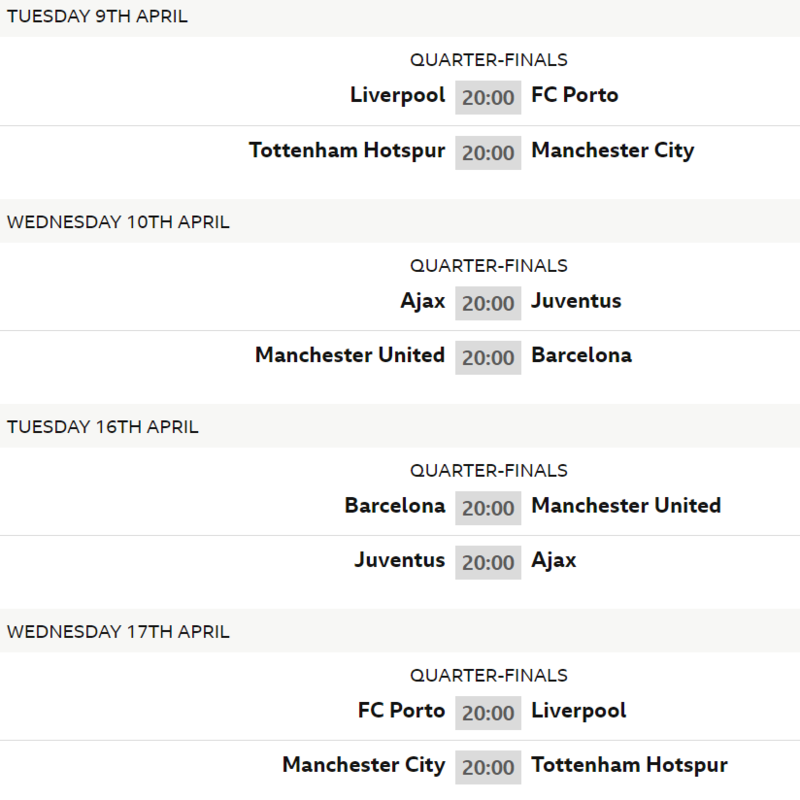 Porto, Juventus, Man Utd and Spurs to go through. And NO, am not drunk or high! To be honest, I have the same sinking feeling I had before Wembley 2011. Yes I’m a negative Norman. Gotta go with your head, I guess. I'm with you. I think we might see an all-English final. Scorpy Absolutely crapping it and loving it! Oh God, a Liverpool vs City final would be a fecking nightmare. I bet, but I can see it happening. I can't see us failing to get past Porto, and we'd be a pretty good match for Barcelona (sorry, I'm expecting them to win). Spurs have a chance versus City, but I still fancy City 8 times outta 10. I also give them the edge over Juve/Ajax. Everything is in right place for Messi vs Ronaldo final! Yeah, I agree with all of your predictions to be fair, though I'd go with Juve to beat City in the semis due to the Ronaldo factor. That represents a genuine dilemma. Unlike the league where I couldn’t care less if city won it, (because I’m over it now and Liverpool doing so would be too damn painful) it’s sort of the opposite in the CL. I’ve seen you lot win it before, but city winning it sort of completes their little project, and likely a quadruple as well. That’s much harder to decide. I think I’d prefer to just hide under the bed until next May. Liverpool to win the league, City to win the CL along with the FA Cup and League Cup so they'll have won their own "treble". Worst of both worlds. I think I’d prefer to just hide under the bed until next May. Well.. make sure you have enough food and drink supplies. Maybe a bokk or two.. Still underdogs though, I would think. Yeah. I'm expecting an upset somewhere. I think this is where it'll happen. Yeah but the way we play wouldn't make us that unlikely to progress. It wouldn't be an Ajax/Madrid or United/PSG level of surprise, that's for sure. I don’t have high hopes for them. I’ll be surprised if it’s not done after first leg, Juve are good and experienced European team. Are they used to face a side with Juventus' playstyle? I think they'll have better chances when the other team comes out to play. Juve vs Ajax will be something similar to those Monaco - Juve games two or three years ago. men against boys. 1-1 or 1-2 in first game, than another boring 2-0 win in return leg. City won't beat Spurs away I think but will just about edge them in return leg. In any case, it will be closer than most of us think. Liverpool will beat Porto easily at Anfield and will score at least 3 goals so away game won't matter that much, which will end as goalscoring draw. United have more chance to cause upset than any of the other outsiders. I just have a feeling that Spurs are going to raise their game for the first CL match in their new stadium. I hope so. It could happen. To stand a decent chance of going through to the semis, in the first leg we need to either win by 2 clear goals or else win 1 - 0. Liverpoll will win with 2-3 goals. Or more. The other 3 games might go both ways. Spurs might surprise. They have overcome the crisis and played quite well against Liverpool. My worry about United is the defence. It really isn't very good and against those Barca attackers ...Let's hope that Ole will find a way to deny them space. Porto, Spurs, Ajax and United. I'm willing to bet someone's house on that. Same here. I am willing to bet your house on it too. Haha, joke's on you, I don't have a house. I'd be real tempted to bet on Ajax against Juve if their RB wasn't out. Who cares. The Europa League is the one everyone really wants. This on paper. However, football, eh? On paper there are also always surprises. So if there would be one surprise in the quarter finals, which team would it be? I sort of fancy Porto, realistically or not, on the premise that Klopp teams tend to run out of steam end of season combined with the energy spent on the PL title run. Spurs & United have more chance than Porto for me. It will be incredible if this isn’t the outcome. You’re not being negative, it’s a fair call. Ajax, Spurs, Utd and Porto have no right continuing on form/quality of squad. BUT we all know the CL doesn’t work like that. See: Liverpool in 2005, Chelsea in 2012. This might be the underdog’s year. Are Porto really that bad? No chance of an upset? They must have improved a little since last year. Each tie has a clear favourite but I'm thinking a surprise might happen. City have been playing below their level now for what seems like a fair few games (and still winning to their massive credit). Spurs will be fresher and the new stadium effect might help.